Hiddur Mitzvah means “making a commandment beautiful.” Its aesthetic translation is found in the use of fruit garland, adorned ceilings, and wreaths used to decorate sukkahs. Pocket Space is inspired by an aspiration to celebrate the aesthetic value of the fruit harvest and takes cues from its vibrancy, its fine scale aggregation, and its holistic sculptural affects. 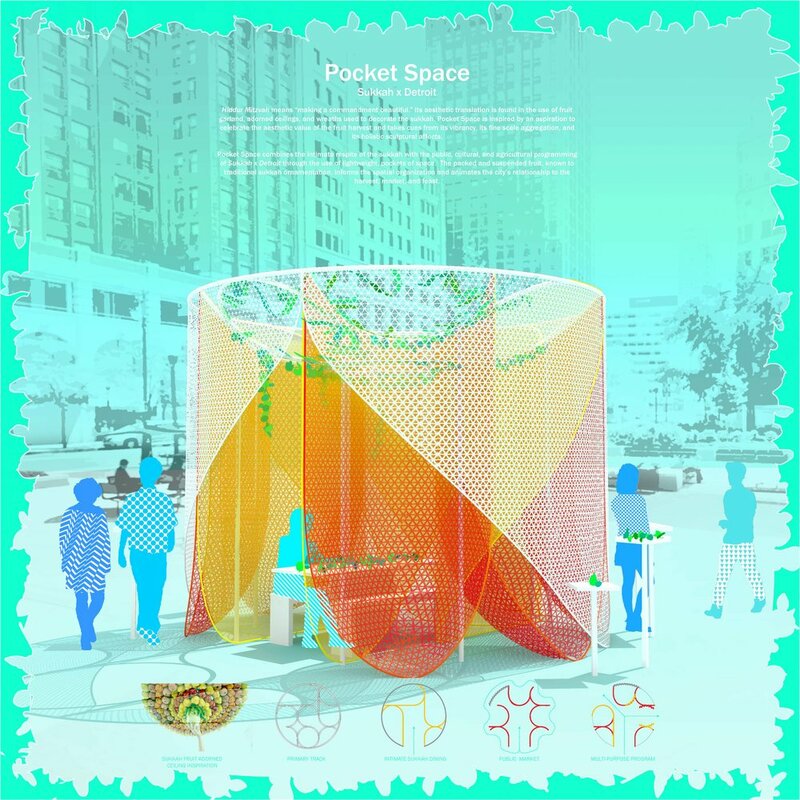 Pocket Space combines the intimate respite of the sukkah with the public, cultural, and agricultural programming of Sukkah x Detroit through the use of lightweight, pockets of space. The packed and suspended fruit, known to traditional sukkah ornamentation, informs the spatial organization and animates the city’s relationship to the harvest, market, and feast. 1-The inner most layer defines the three “walls” of the sukkah. 2-The mid layer defines the “pockets” which create a visual buffer between inside and out, loosely define market “stalls,” while maintaining a strong visual connection between programs. 3-The outermost layer or the “veil” orients the visitor and defines the entry into the sukkah. JE-LE (\ˈje-lē\) is an architectural design and research office led by Michael Jefferson and Suzanne Lettieri, founded in 2014. The practice has appeared in exhibitions in New York City, Boston and Ithaca, New York and has been published in Project, the Cornell Journal of Architecture, and the Association of Collegiate Schools of Architecture.